Many spring break spots like Daytona, Cancun and Panama City are known for being wild and crazy, but If you are considering a trip to St. Augustine you are more likely interested in a laid back vacation. Over spring break that calm vibe doesn’t really change. St. Augustine is the perfect destination for a relaxing, family-friendly spring break. With the warm weather finally starting to be a regular occurrence around spring break St. Augustine has many outdoor activities to keep the whole family happy outside. If you are looking for a bit of adventure try the St. Augustine Eco Tours. The chance to get up close and personal with marine life while sailing, kayaking or boating will surely be a memorable one. If you want to explore without a guide you can rent a stand up paddle board from Surf Station and try it out around the nearby Salt Run. I did this last summer for the first time and had a blast! As long as large boats didn’t come through and cause major wake I was able to stay up and got the hang of it pretty quickly, so don’t be nervous if you’re a first-timer. If it’s still a little too cool for water sports while you’re here, you could take a trip to one of historic St. Augustine’s outdoor attractions. The Fountain of Youth has 15 acres of history with wandering peacocks, replica structures, and lots to learn - all right on the water. At Colonial Quarter everyone gets to experience the history of St. Augustine by interacting with a blacksmith, gunsmith and leatherworker. You’ll be hands on and surrounded by the history of the last three centuries of St. Augustine, both educational and fun. There are tons of other things to do like the Pirate and Treasure Museum, The Old Jail, Fort Menendez, and other attractions. 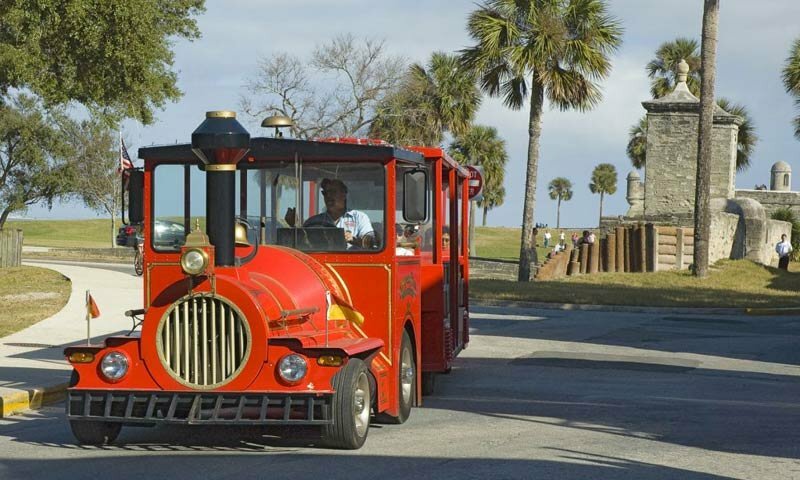 Old Town Trolley Tours and Ripley’s Sightseeing Trains allow you to enjoy the fresh air while touring the town. This is one of the first things you should do if you are planning to explore St. Augustine’s past while visiting. The knowledgeable driver will take you on a trip around downtown St. Augustine referencing historical facts along with occasional local restaurant tips, so pay attention! Over a full day of sight-seeing, frozen treats are the perfect pick me up and are easy to enjoy while walking through town to your next stop. If you walk down St. George Street you are sure to be lured in by the sweet smell of ice cream cones baking at Kilwin’s. The Hyppo is also located downtown and the variety of gourmet popsicles is pretty amazing. Flavors like Pineapple Cilantro, Strawberry Basil, and Blackberry Clove may sound a little weird, but they are fresh and oh so good! If you need to get out of the sun for a bit, or if the rain is imposing on your plans, St. Augustine has many indoor activities to keep everyone happy. Ripley’s Believe it or Not! Museum will get everyone’s imagination going with the many oddities on display. The lifelike wax figures on display at Potter’s Wax Museum will be variably recognized by the young and old with iconic sculptures from Tiger Woods, to Kramer from Seinfeld, to Queen Victoria. I spent most of my college spring breaks here and never traveled to some crazy party town. This was partly because Flagler College’s spring break is so short, but also due to the fact that St. Augustine is just the perfect place to relax, and that was all any of us want to do over those few precious days off. If a stress free, educational trip is what you are looking for, then you should check St. Augustine out. You will get to unwind, the kids will have fun, and they’ll get a history lesson or two without even realizing it. Local St. Augustine blogger Meaghan Alvarado is a Flagler College graduate who writes on many topics ranging from fashion and food to crafts and local St. Augustine happenings. Check back here at VisitStAugustine.com regularly to see the great events and activities our guest bloggers will be writing about next, and check out Meaghan's personal blog at http://justmeaghan.com/. This article was originally written in 2014 and has been updated to reflect current information in 2019. Thanks for reading, Fran! And very relevant question :) For St. Johns County Schools, Spring Break will be March 18-22, 2019. But it will depend on the school district, whether it's a private or public school, and whether it's a university, high school, middle school, etc. If you search for the spring break for your specific school or district, they usually publish dates far ahead of time. Even looking for their 2018-2019 calendar should work. I hope this helps! Local St. Augustine blogger Meaghan Alvarado is a Flagler College alumni who writes on many topics ranging from fashion and food to crafts and local St. Augustine happenings.